Most types of PEX pipe is guaranteed to last 25 years or longer if it is correctly installed. The warranty protects against manufacturer’s defects as long as the piping was installed by a professional and all of the criteria were met during the installation process. Do PEX Pipes Burst After Being Frozen? PEX piping is designed to contract and expand with the temperatures allowing it to retain its original shape. Once the pipe has thawed, it will return to its normal size without bursting or being compromised in any manner. Will Temperatures Affect PEX Pipe? 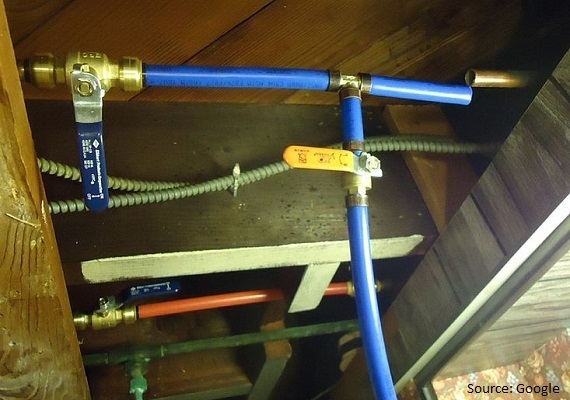 PEX piping can withstand hot water up to 200 degrees if the water pressure is maintained at 80 pounds per square inch. The pipe can also withstand freezing temperatures as well. Will Hot Water Damage PEX Piping? Hot water will cause no damage or degrade PEX pipes as long as the pressure of the water remains constant with the PSI. Water that is 200 degrees F. or lower can travel quickly through the pipes as long as a PSI of 80 is maintained. Can PEX Piping Be Bent? PEX piping is extremely flexible and can be bent and shaped as needed. Because of how it is constructed, PEX can be twisted to go around corners or travel along uneven lines. Is PEX Piping Suitable for Underground Water Lines? PEX pipe can be buried and will remain pliable enough to allow different temperatures of water to flow through without restriction. It can even be embedded within concrete slabs. Is Oxygen Barrier PEX Suitable for Drinking Water? PEX piping can be used for drinking water and has been determined to be safe at different temperatures. The oxygen barrier is primarily used to prevent the pipeline from rusting. PEX pipe has many benefits and can be used in almost any plumbing project. PEX is an extremely popular and versatile piping material that many plumbers trust. PEX piping is more long-lasting than other piping materials and has many applications including radiant heating mechanisms for residential and industrial plumbing. If you are planning to hire a professional plumber in Santa Ana, CA, you can visit our office or call us at: (714) 860-4250.